Since 2010, Solar Household Energy has collaborated with The Nature Conservancy (TNC) to introduce integrated cooking technologies with solar ovens, parabolic solar stoves and fuel-efficient stoves as part of a larger regional reforestation program. The project is in Tilori, located on the border of Haiti and the Dominican Republic and on the boundary to Sabana Clara Forest Reserve. In the past, the main source of income and subsistence in Tilori, Haiti was harvest from fruit trees and other agricultural activities. With severe deforestation resulting from residents collecting firewood for cooking, the opportunity for income from farming and agribusiness in the area was greatly diminished and paved the way for illegal charcoal trade and environmental degradation. 2010 – An integrated cooking project in Tilori, Haiti – In 2010, Solar Household Energy (SHE) partnered with The Nature Conservancy (TNC) to implement an integrated cooking pilot project combining solar cookers and fuel-efficient stoves in Tilori, Haiti, to complement TNC’s reforestation activities in the area. SHE’s co-founder and trainer Louise Meyer conducted four Tilori site visits over a two-year period to carry out a field assessment, distribute clean cooking technology, provide training and follow-up, and collect monitoring and evaluation data. 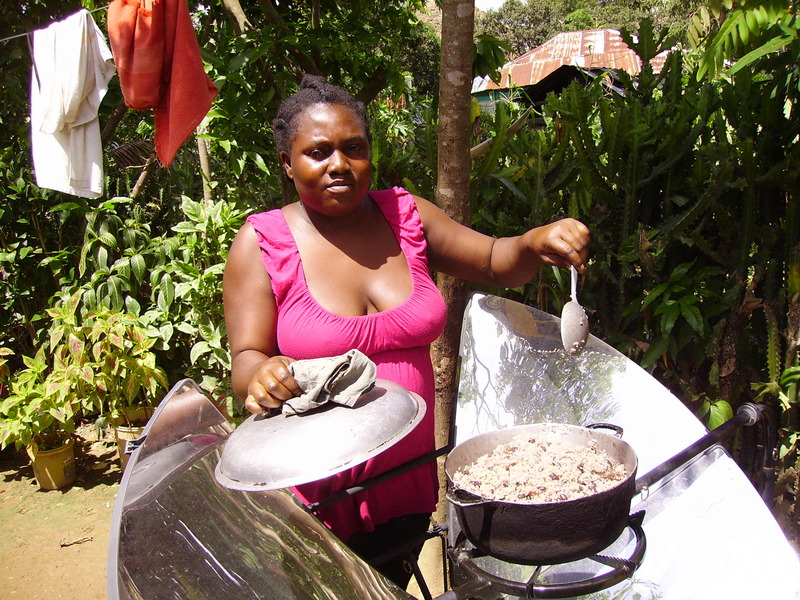 In 2010, Louise traveled to Tilori and Dajabon, DR to conduct a regional analysis and field assessment, identifying the “Sun Oven” solar cooker and “Stove-Tec” fuel-efficient stove as the most appropriate clean cooking solutions for the Tilori community. In October 2011, she trained 30 local women (25 Tilori women and 5 Dominicans) in the usage of each of these clean cooking solutions. In February 2012, she returned to Tilori to evaluate the impact of integrated cooking in the community and found that all clean cookstove recipients reported less soot and smoke during their cooking process. 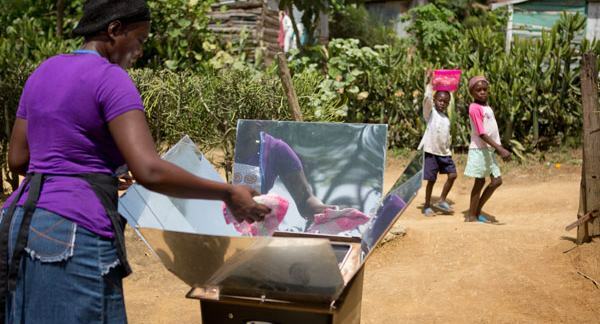 During the final evaluation mission in September 2012, SHE found that most families preferred larger pot sizes (11 liters) for solar cooking given the larger average household size, which is around six. Overall, participants experienced a 50% reduction in their daily overall fuel consumption (wood/charcoal/other) and in wood collection time (for some, the figure was significantly higher at 80%, e.g. 25 lbs average wood fuel usage reduced to only 5 lbs). Through the Tilori initiative, SHE and its partners are working to improve the lives of residents by reducing deforestation, expanding access to clean cooking technology, and empowering and training women to use and share solar and fuel-efficient technology. SHE is currently working with TNC to introduce parabolic solar cookers capable of faster cooking, grilling and frying. See the Solar Cooking Wiki TNC page or the TNC site for more details. 2012 Peace Corps training in Dominican Republic – In April 2012, SHE held a separate two-day training for 22 Peace Corps volunteers in Santiago, DR, sponsored by the USAID/TNC Environmental Protection Program. The 22 volunteers received instruction in the use and promotion of the integrated cooking system already tested in Tilori – this helped broaden their knowledge of solar, fuel-efficient and traditional cooking methods. 2015 Solar stove introduction in Tilori, Haiti – In 2013, upon SHE’s recommendation, TNC introduced 85 “Sun and Ice” parabolic stove solar cookers along with an additional 177 StoveTec fuel-efficient stoves and 30 pots to 177 families in Tilori. Beneficiaries were selected based on need (favoring single mothers and lower-income households) and level of expressed interest. This project was successful in empowering women, reducing deforestation, and created a high demand for more solar stoves. In September 2015, Solar Household Energy (SHE) entered into a partnership with Solar Electric Light Fund (SELF) to introduce 25 SolSource parabolic solar cookers in Tilori, Haiti, expanding the existing clean cooking efforts. SHE managed the project, contracting solar cooker expert Onel Joseph to carry out the project training and assessment mission in Tilori in October 2015 and to collaborate with SHE in supporting local leaders to carry out monthly follow-up surveys and quarterly focus group meetings for one year. SHE’s end-of-year 2017 solar stove adoption project evaluation found that, according to the scoring system promoted by the Global Alliance for Clean Cookstoves, the SolSources had “Very High Adoption” and “High Impact.” The adoption value stems from average SolSource usage frequency (10.4 times a week), average SolSource condition (most were in good condition but dirty), average SolSource satisfaction levels (4.9 out of 5), and the interest in replacing the SolSource at the end of its lifetime (overwhelming demand for more solar stoves, and 98% who would recommend it to a friend). The impact level value stems from average stove usage frequencies and stacking (SolSource 10.4 times a week, fuel-efficient stove 17.9 times a week), the traditional stove usage and its location (the three-stone fire was virtually no longer used), perceived health improvements (98% reporting “three or more” signs of improved health), and perceived fuel savings (97% reporting “some savings”).